When I first visited this amazing Paonia, Colorado home in July of 2011, and was taken into the back yard, I fell in love. The grape bower made of old tree limbs, with a shady alcove to sit underneath -looking out at a rich garden plot beyond. 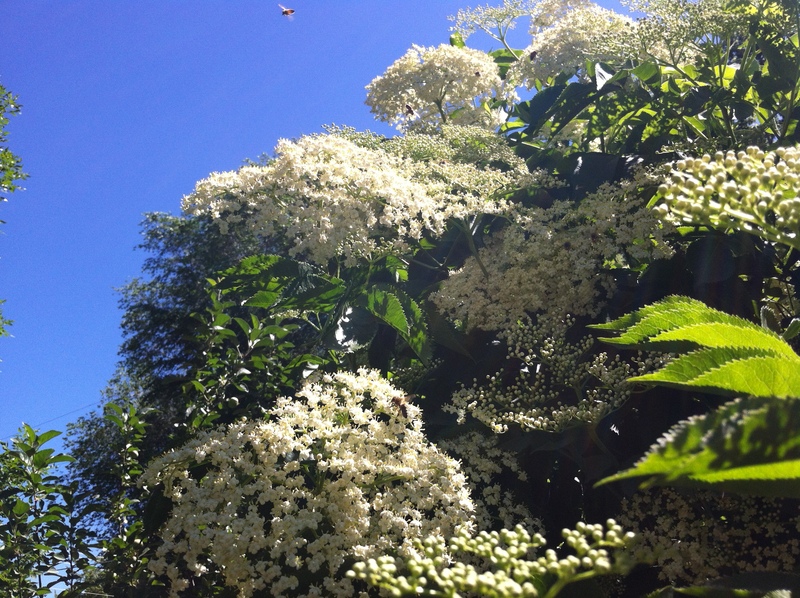 And the towering bushes framing the garden, were loaded, LOADED with elderberries. 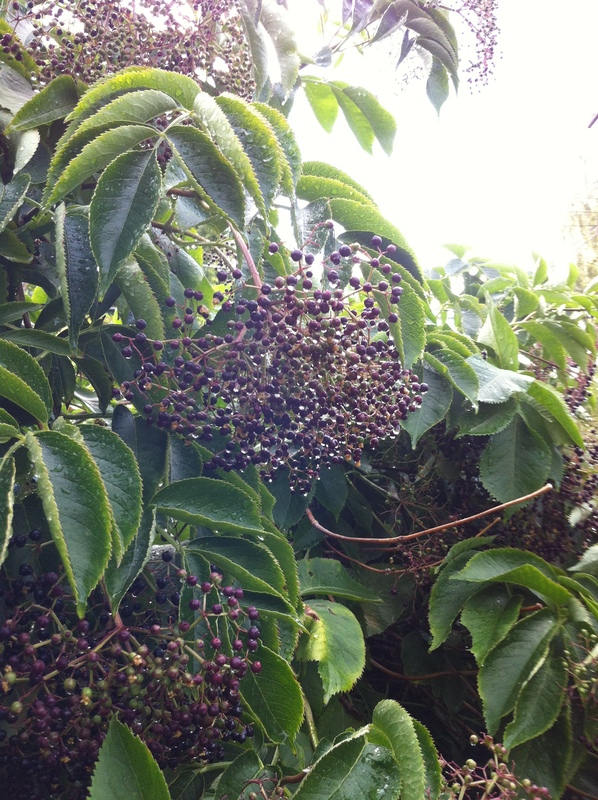 More elderberries were found in the side yard, next to an Italian plum tree, lemon balm and mint below. And the next spring – as it did become my home – oh my what a gift. 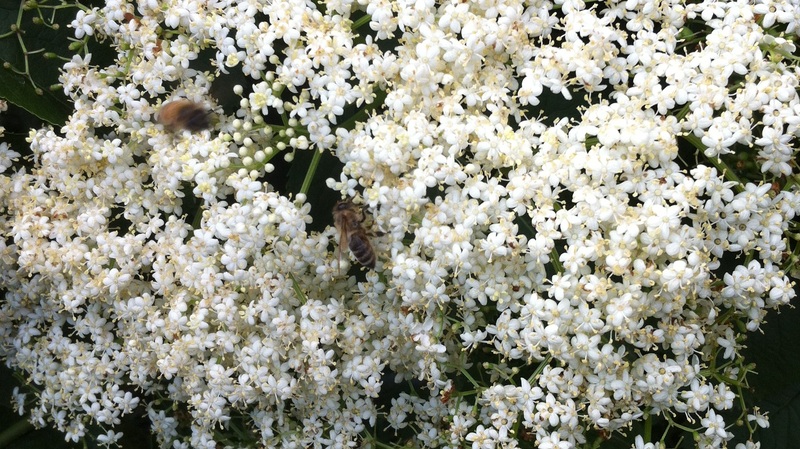 White clouds of elderberry blossoms and the magical whir of dozens of bees in bliss. I decided to make syrup from this incredible bounty. (I also decided, as you may remember from last summer, to make LUSCIOUS organic local Paonia peach and elderberry crisp….) I didn’t really follow a recipe for the elderberry syrup, or really have a precisely measured formula to offer you here now. But next summer, if you or a neighbor has an elderberry bush, and you procure some elderberries for your very own, if you wash them, and painstakingly de-stem all the little treasures – The Muddy Kitchen from the east coast wrote she uses an afro pic, much to my delight – then place them in a big pot with water to barely cover, and boil until very soft, strain, combine with a good local honey then bring to a gentle boil again, you will make syrup. 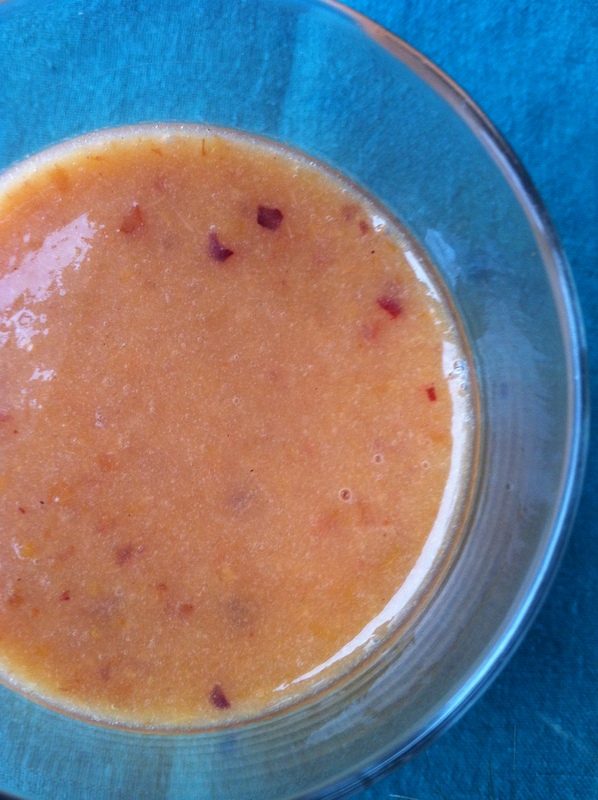 Simmer awhile to reduce, jar up, and keep in the refrigerator to use as desired. confession: I love purple, and when purple moves I love it even more. so beneficial for your immune system, and tasty too. What’s not to love? When I told my friend Jeff that I liked to pour my elderberry syrup on waffles, (maybe GINGERBREAD waffles….) he replied with this guttural exclamation of desire and lust I wish I could offer to you here. And then, there is the more bland but extremely valuable and probably paramount medicinal use, which I like to offer up as shots, just to make being sick more fun. And during the extremo flu season this winter, I am so grateful for that! 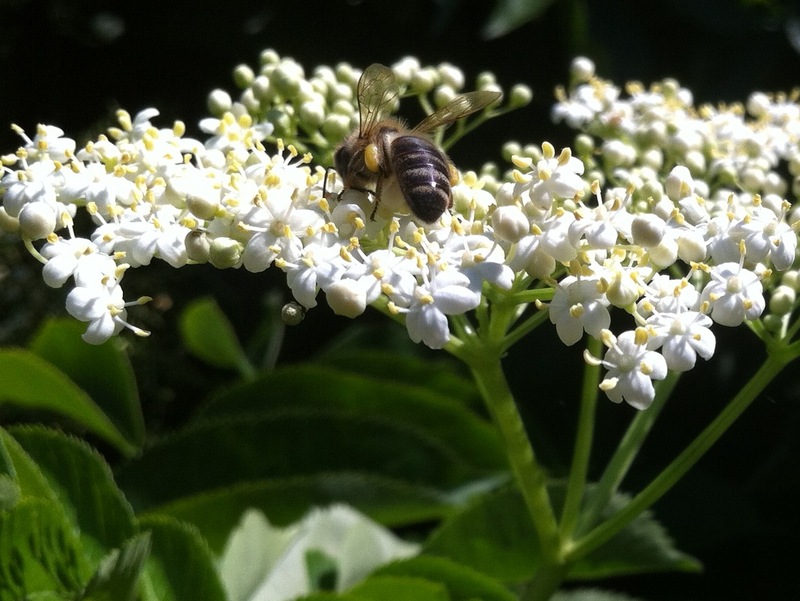 Bless the elderberry. Any way you ingest them, you are receiving what they have to offer. This morning, it’s a smoothie I’m drinking. Actually I’ve been making them several mornings now. I’m using peaches I froze last season, and I love this combination. Peaches, still slightly frozen. Almond milk. Cinnamon. And a good splash of elderberry syrup. i love purple too and i love this post!!!! Aww, thank you Audrey! PURPLE. I even love the word as it rolls off my tongue. Thanks so much for visiting – and following! my blog. I will stop by yours soon!